The older my kids get, the more expensive their tastes become. I don’t have to tell you that teaching our kids the value of money from a young age is vitally important. Quite simply, the very best way to teach our kids financial responsibility is to provide them with the opportunity to earn money for themselves. What better way to get started than with a summer job! And since those video games and designer clothes won’t pay for themselves, let’s take a look at 13 summer jobs just perfect for tweens with an entrepreneurial spirit! 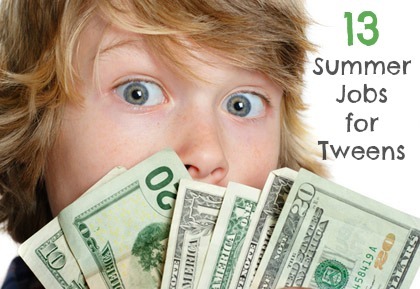 Great blog that lists amazing ideas for teens (or even terns) to earn money over the summer!!! Check it out! !